The latest video in our Dezeen x MINI Living Initiative series investigates a design for a hydroponic vertical farm nestled among the skyscrapers of Shanghai. US architecture firm Sasaki Associates has designed the farm to produce food for the inhabitants of China's largest city. The farm's output will largely consist of leafy greens like kale, spinach and lettuce, which are staples of the local diet. The crops will be grown along a series of looped rails arranged side by side in a greenhouse, which will rotate to ensure even distribution of natural light from the sawtooth roof. The project aims to offer a space-saving alternative to traditional land-intensive farming, prompted by high land prices that encourage the development of vertical infrastructure. 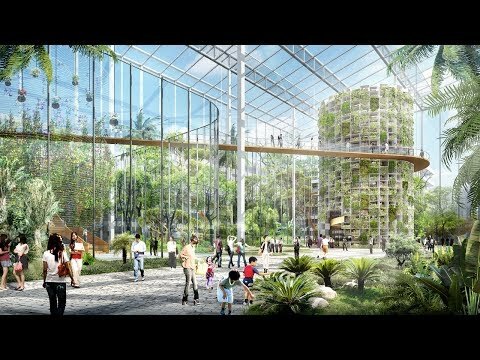 It will also features a variety of farming techniques suited to the urban environment, including floating greenhouses, algae farms and a vertical seed library.